Want to get to know other locals in Purley and Croydon? WELCOME TO ‘THE PURLEY BREAKFAST CLUB’! 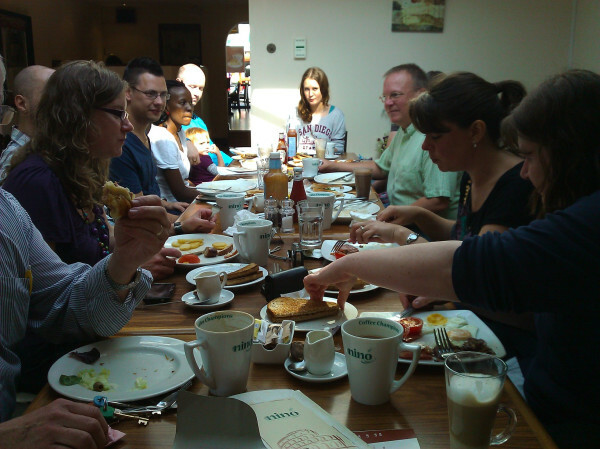 ‘The Purley Breakfast Club’ comprises of a group of Purley and Croydon locals who meet together monthly on the last Saturday of each month at Cafe Blue, Purley anytime between 9.30-11.30AM. Anyone can come along and there is no agenda at all. If you want a relaxed space to make new friends and contacts then look no further than this informal gathering! This entry was posted in Local community, Purley 2.0 - A Project and tagged #purleybreakfastclub, blue broccoli, breakfast, community, croydon advertiser, jonathan rose blog, jonny rose, purley, purley 2.0, social media, susie white. Bookmark the permalink. Enjoyed attending my very first #Purleybreakfastclub see you next month. I’m @roxy641 on twitter.